You’ve heard all the negative things about saturated fats, but not all saturated fats are created equal. 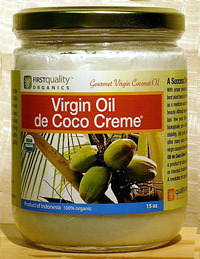 In fact, medium-chain fatty acids such as coconut oil have many profoundly beneficial health benefits for the body. This could be one of the most important dietary changes you make in your life. Our Virgin Oil de Coco-Creme is the best cold-pressed coconut oil on the market; most other brands are heated at some point in the production process, and/or RBD (refined, bleached, deodorized). This organic brand is very stable with a sweet taste and aroma, and a shelf life of at least 2 years (unopened) if kept in a cool, dry place. Sure, you can buy other coconut oils for less in the health food store, but there is simply no comparison between those brands and Virgin Oil de Coco-Creme. Do a taste test and you’ll see! 15-oz. jar in glass. This item is not returnable. For more information about how this oil is processed, click here. For books on coconut oil, click here.